I have recently returned from a trip to Huelva. I had heard only good reports from people staying and playing golf in this region and I was delighted to be travelling to the area to test it out for myself. We departed on the 07.10am flight headed for Faro Airport. As myself and my Dad boarded the flight we heard a very familiar voice, it turned out that we had been lucky enough to pick seats beside the legendary George Hook. As I had organised this trip as a birthday present for my dad I managed to convince him that I had also arranged for him to be sitting beside George. I don’t think he bought it, but it was a good surprise nonetheless and a great start to the trip. We arrived into Faro airport on the Tuesday morning flight. Our drive to El Rompido Golf Resort, where we would be staying for the few days, was broken up nicely as we couldn’t resist but stop into Monte Rei Golf Club for a game. 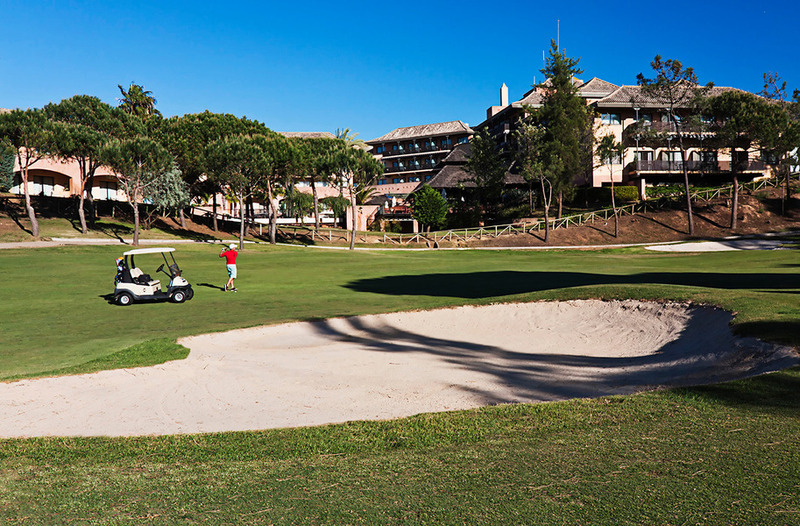 Monte Rei Golf Course is the No.1 and most sought-after golf course in the Algarve, it isn’t hard to see why. Upon arrival we were greeted by two members of Monte Rei’s professional team Stuart and Sarah who took our golf clubs to be cleaned before being dropped to the practice ground where we had time to warm up on the excellent practice facilities until our tee time. The golf course is set in the mountains which provides a fantastic backdrop for each of the holes. The warm welcome and pristine condition of the golf course along with the top-class service make for an unforgettable round of golf. Each player is also given a Monte Rei bag tag on the 18th green with their name engraved on it which is a nice touch. As we still had a bit of a drive to our destination we decided to get back on the road. We were heading for the very scenic area of Huelva, which is located equal distances between Seville and Portugal airport which gives great access to the region. Over the years important competitions of both amateur and professional categories have been held in some the highly renowned golf courses designed by some legends of the game along with respected players. Our home for the few days located just over an hour’s drive from Faro airport is the El Rompido Golf Resort which is more than worthy of its 5* rating. The resort offers a driving range and a number of practice chipping and putting greens which makes it very popular with groups of golfers and pro groups alike. The two 18-hole golf courses located on site blend naturally into the surrounding landscape of marshes, orange trees and pine trees. The front 9 holes on the South Course requires a lot of accuracy off the tee, as you get to the back 9 holes the course begins to open up and offers some spectacular views of the Atlantic Ocean. The North Course may look like less of a challenge compared to the South, however water comes into play on many of the holes and as you get to the back 9 there are plenty of pine trees to contend with. The 5* on site hotel at the El Rompido Golf Resort offers guests half board basis as standard with the option to upgrade to Semi All Inclusive basis. I would recommend this as you can enjoy a few drinks and a great selection of food with this package. The rooms in the resort are very modern, all with private balconies which overlook the gardens, swimming pool and the golf courses which surround this picturesque hotel. On our third day we went to play Islantilla. This golf course has previously hosted the most prominent golf event in Andalucia, the Spanish Masters in 1995 where two Irish players Paul McGinley and Des Smyth featured in the top 10. Guests can choose between three 9-hole golf courses, I would suggest the Yellow and Green nines. The course was designed by Enrique Canales and Luis Recasens and is unlike any golf course I have played before. The three 9 hole layouts are spread over the land surrounding the hotel and feature plenty of bunkers, large water hazards and even larger undulations. This makes for a challenging yet enjoyable game of golf. The Islantilla Golf Resort Hotel offers everything you would need in order to enjoy your golfing getaway and is another ideal location for professional groups. The hotel has bright nicely decorated rooms all with private balconies which offer views of the fantastic pool, gardens and golf course which surround the hotel. The hotel also has a beach club which is a great place to relax in the sunshine, which this area gets plenty of. I had heard good feedback from people who have played this course, as it is just a short drive away from both the El Rompido and Islantilla Golf Resorts we decided to go for a game. Designed by Jose Maria Olazabal the course opened its doors in 2010 and is already up there with some of the best courses in the region. The subtle bends of each hole require precision off the tee along with the large protected greens the course fits perfectly into the natural shape of the surrounding land. A unique feature of La Monacilla Golf Course is each tee box has 6 tees to choose from which allows players to decide which course best suits their ability. This makes this course suitable for all players from professional to beginner. As most of the holes are lined with pine trees, which are ready to throw your ball back into play when you hit them, players can enjoy their round while being surrounded by nature. I hope that this blog has opened your eyes to some of the gems located around this southern part of Spain and maybe the next time you land in Faro Airport you will turn right to explore them. If you would like any more information on booking a golf break in Huelva, be sure to get in contact with us. Along with our expertise we always have great offers available throughout the year.